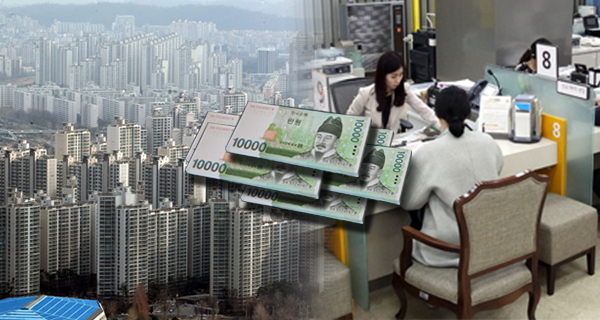 The South Korean government aims to rein in household debt from growing more than 5 percent this year after the country’s household debt hit a new peak by requiring stricter guidelines in endorsing consumer loans. The Financial Services Commission (FSC) announced Thursday that it will mandate the non-banking financial sector to take into account of debt service ratio (DSR), which shows a household’s burden to pay back debts, when lending starting the second quarter this year. Under DSR, a lender would reflect an index that divides principal payments of not only mortgage loans but also credit-based loans by income when calculating the amount of loans that can be taken out by a borrower. The banking sector has already adopted the tighter debt service ratio DSR since last October under the direction of the government aiming to rein in the speculative housing bubble. The authority will also require banks to increase their reserves by 2.5 percentage points from the current 13 percent against household loans, in case of the real estate market fluctuation. In addition, the FSC will restrict self-employed businesses with high property loans from taking out additional loans. All of the measures are intended to cap the annual household debt growth rate below 5 percent over the next three years and keep it from going over the projected nominal gross domestic product (GDP) growth of 5 percent. The FSC also considers revising laws to strengthen regulations on illegal lending from the private sector, as people tend to turn to illegitimate private lenders charging exorbitant interest rates when it gets difficult to borrow money from authorized banks. It will seek to seize all interest gains from the lenders charging above the maximum rate of 24 percent. The country’s household debt hit a new high last year at 1,534.6 trillion won ($1.36 trillion) as of December, up 5.8 percent from a year ago. Despite the record-high debt levels, the growth pace slowed down from 8.1 percent in 2017 amid the government’s tougher regulations to crack down on the overheated housing market.